← Paramilitary gangs in metropolitan Rio de Janeiro: what’s to be done? Rio de Janeiro is perhaps the most “Peronist” of Brazilian states, heavily marked by the history of governments headed by Getúlio Vargas, as president, in the thirties, forties and fifties, and by Leonel Brizola, as governor, in the eighties. Rio state residents are thus inevitably attracted to fatherly (or motherly) populist candidates who claim to speak for the less fortunate. Dilma did well here, splitting the vote almost evenly with Aécio and Marina, each with about 30%. In contrast, in the neighboring state of São Paulo, marked more by the bootstrap experience of a large immigrant population, Aécio beat Dilma, with 44% of the vote to her 26%. Marina came in third, with 24%. Dilma is likely to win the state of Rio in second-round voting. Voters managed to keep former governor Garotinho — who fits the profile but seems at last to have burned his political bridges — out of the Governor’s palace. The second round of voting, set for Oct. 26, pits incumbent Governor Luiz Fernando “Pezão” (Bigfoot) Souza (41%, yesterday) against Senator Marcelo Crivella (20%), a conservative bishop of the Igreja Universal do Reino de Deus, founded by his uncle, Edir Macedo. Macedo owns the Rede Record media empire, Brazil’s second largest in audience share and advertising. Both second round contenders display characteristics of oldtime politicians. Pezão was Sérgio Cabral’s vice governor during both his terms, and took over from him this past April, after the latter’s political bankruptcy in the wake of corruption allegations and last year’s demonstrations, some of them outside his apartment building. Brazilian mayors, governors and presidents cannot serve more than two consecutive terms. 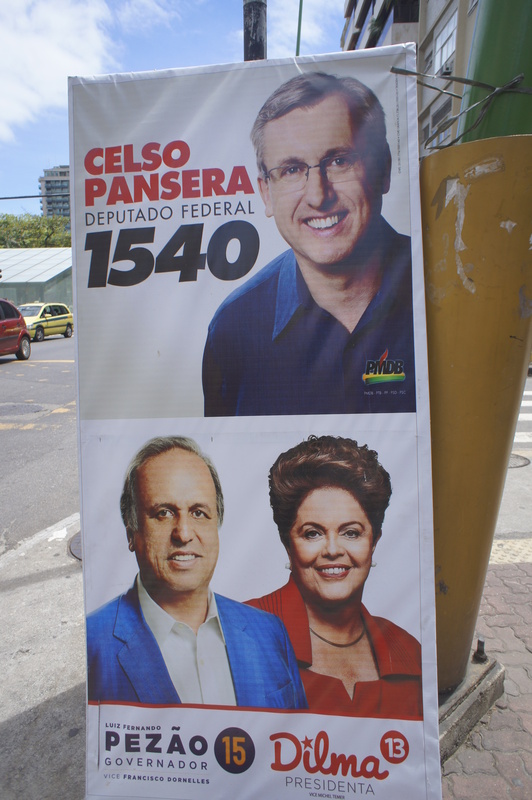 Crivella, who held the post of Fisheries Minister for two years in Dilma’s government, has an unblemished Senate record and believes homosexuality is a deviation, poses a bigger threat to Pezão than Garotinho would have, since the latter has a relatively high rejection rate among the electorate. Crivella is likely to garner many of Garotinho’s 20% of the vote and the 10% of Lindbergh, the Workers’ Party contender. Both second-round contenders say they will focus on social and other support for the state’s pacification program, a key public policy. If Pezão — a paternalist from the interior of the state, famous for slogging around in deadly highland mudslides in 2011 — wins, his Public Safety Secretary, José Mariano Beltrame, is likely to stay on. The current team would have the advantage of their experience as they attempt to deepen and expand the state’s attempt to integrate the metropolis’ disparate areas. Crivella, a self-made engineer, seems likely to focus less on state income transfers and more on self-help, given his official platform. His understanding of the current public safety and social policies and the difficulties they have come up against may be limited, given a statement he made yesterday about the role of the Pereira Passos Institute. But this can easily be remedied. Pacification has significantly brought down crime rates in the city of Rio de Janeiro since its inception, in late 2008. But the program has drawn strong criticism from both favela residents and specialists, who say the government must offer better police training and supervision, and meet residents’ needs and desires more effectively. Bottom-line, the problems stem from inertia within society at large and among government officials and agencies, accustomed as they are to fiefdoms and top-down management, rather than teamwork and true citizen participation. Since the national capital moved to Brasília in 1960, the state of Rio de Janeiro was traditionally an outsider to national politics and priorities. This began to change in 2006, as an alliance developed among three levels of government. That alliance has fallen apart, largely because of the idiosyncracies of this election. But it’s unlikely that either Dilma or Aécio would significantly boycott the administration of either Pezão or Crivella for political reasons, given ongoing key investments in mobility, sanitation and public safety — and most important, the advent of the 2016 Olympic Games. Overall, Brazilian election results demonstrated the leaps and lags in the development of the country’s democracy, which dates only to 1989. Public opinion polls failed to capture Aécio’s growing appeal (or Dilma’s diminishing lack thereof), probably due to last-minute changes of heart on the part of voters. Absenteeism, blank and null voting were high and Rio accounted for the largest number of election day arrests in the country, a likely result of a close police watch in the city’s West Zone, where paramilitary gangs have a heavy hand in politics. Electoral trash, though prohibited, was everywhere. Many went to the polls dressed in the national colors. Voter repugnance, lack of interest and volatility would augur well for a return to the streets sometime in the future. 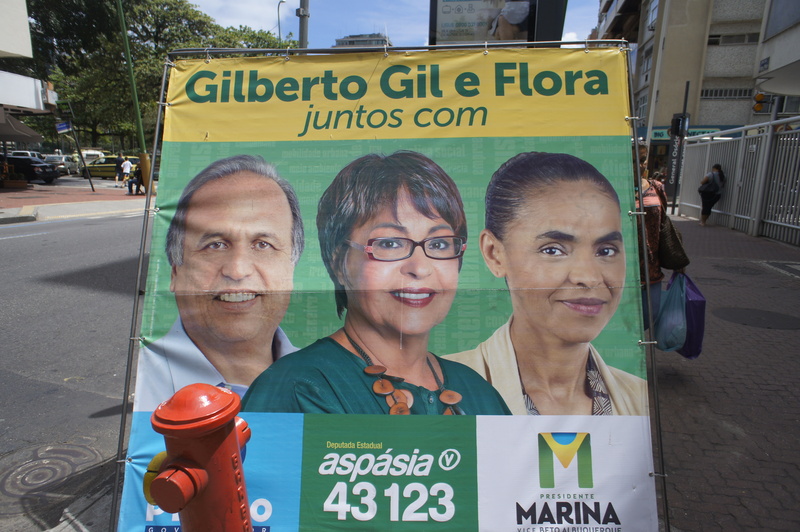 Though presidential candidate Marina Silva, eliminated yesterday, failed to explain or demonstrate the “new politics” she proposed, Brazilians face the challenge of updating their politics to match emerging voter sophistication and demands for less corrupt, more efficient public spending. Paradoxically, it may be that part of Dilma’s Workers’ Party shrinking appeal is due to a growing conservatism on the part of those who have left poverty during their watch. The socioeconomic pyramid has changed shape not only because of Bolsa Família and real minimum wage increases, but also due to economic growth — and the educational and job opportunities it has brought. Voters may not see (or believe in) a clear economic-political connection. A taxi driver who grew up in Complexo do Alemão favelas recently told RioRealblog that he abhores the Bolsa Família income transfer program because he believes in hard work. His mother, he noted, adores former president Luís Inácio “Lula” da Silva as much as she loves crooner Roberto Carlos. When she complained to him that government officials kept her waiting at a public health clinic while they took a prisoner in to see a doctor, he scolded her. “Vote for the Workers’ Party, that’s what you get!” he laughed. In Rio, some of those elected are oldtime conservatives, such as Jair Bolsonaro, elected federal deputy; some are surprising notables, such as Romário, the soccer player, elected senator; and some are progressives, such as Jean Wyllys, federal deputy, a homosexual who came to fame on TV Globo’s Big Brother reality program. Progressive Marcelo Freixo, who in 2008 brought the dangers of paramilitary gangs to the public’s attention, was elected to the state legislature, as was traditional politician and cattle rancher Jorge Picciani. The Green Party’s Aspásia Camargo, longtime champion of sustainability in Rio, was not reelected to the state legislature. This entry was posted in Brazil, Transformation of Rio de Janeiro / Transformação do Rio de Janeiro and tagged Brazil 2014 election, Brazil 2014 election results first round, Rio de Janeiro 2014 election, Rio de Janeiro 2014 election results first round. Bookmark the permalink.